We’ve taken our time to get here spending a couple of nights on the gem-fields catching up with Allen’s parents and enjoying the company of all the happy campers at Gem Air before a lovely few days at Idalia National Park which is SW of Blackall. Although we don’t spend a lot of time bird watching when we have a destination for the day we do allow plenty of leeway so we can stop if we see a promising place, hear or see something that needs further investigation. The early mornings can be slow going! Apostle birds also called Happy Jacks or Happy Families, are in great numbers at Gem Air, they move through the park looking for tidbits that campers might have left out. The road into Idalia was through cattle country, heavily cleared and in some cases quite infested with Prickly Acacia. There were no bird sounds even in the late afternoon and the roadsides were littered with macropod carcasses. As we drove past the National Park sign there was an immediate change in the landscape with flowering Slender Broom Bush (Jacksonia vernicosa) and flowering Senna (Senna artemisioides) along the roadside amongst the Mulga (Acacia aneura) and Lancewood (Acacia shirleyi) which were not in flower. It was delightful to see Grey and Red Kangaroos as well as Wallaroos grazing in peace and no bodies along the pleasant 30 km drive into the camping area. 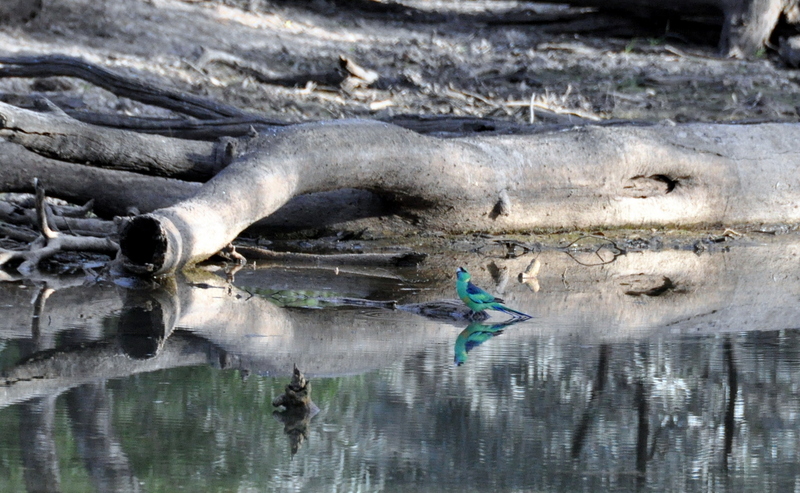 Suddenly a flash of turquoise past the car window – it didn’t take us too long to find another and get our first good look at the beautiful Mallee Ringneck. What a wonderful introduction to a beautiful park. Other birding highlights included Hooded Robin, Red-capped Robin, Crested Bellbird, Hall’s Babbler, Striped Honeyeater, Speckled Warbler and a glimpse of a Chestnut-breasted Quail-thrush. 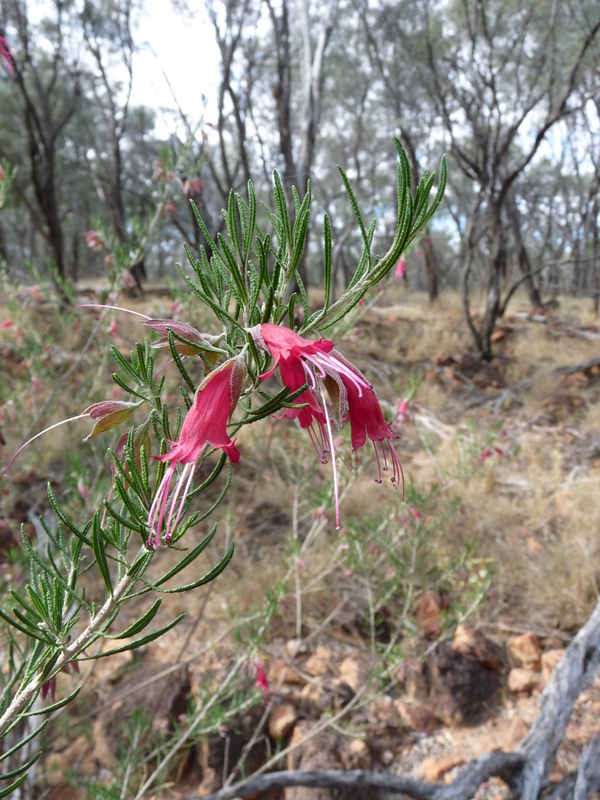 Native Fuschia (Eremophila) provided some more highlights of colour, although we managed to find a few of the many species known to be in the park they were not present in great profusion like the Jacksonia. We enjoyed every moment of our bush camp in this lovely park but it has been fun to spend the last couple of days in Longreach; hot showers and recharged batteries before we set off for Bladensburg N.P. tomorrow. 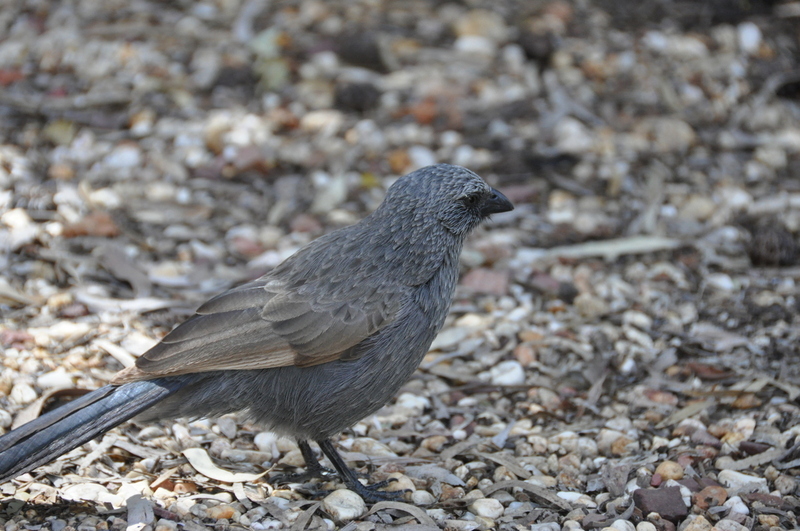 Many similar plants and birds to ones I have seen at Broken Hill. Arid Zone north and south seem similar. Yes I’m sure there are many similarities Denis. 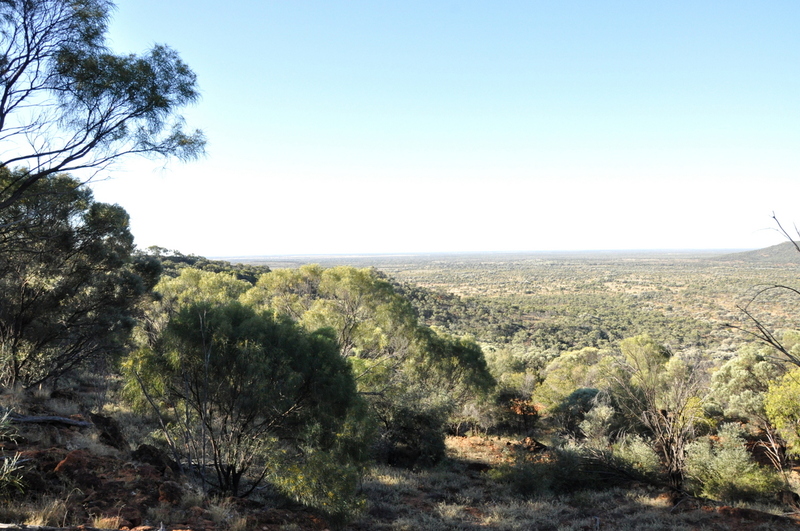 It is all new for us, we’ve never travelled in this part of Australia and we’re loving it. Sorry for the tardy reply but we haven’t had any NextG reception since Longreach apart from a short stop in Boulia last Monday. I’m not going to try posting any more reports until I get home as we’ll be out of range again soon. The wild flowers have just been a delight, and we’ve seen many bird species new to us also. Happy days indeed.